Objectives To conduct a systematic review of interventions used to improve exercise adherence in older people, to assess the effectiveness of these interventions and to evaluate the behavioural change techniques underpinning them using the Behaviour Change Technique Taxonomy (BCTT). Methods A search was conducted on AMED, BNI, CINAHL, EMBASE, MEDLINE and PsychINFO databases. Randomised controlled trials that used an intervention to aid exercise adherence and an exercise adherence outcome for older people were included. Data were extracted with the use of a preprepared standardised form. Risk of bias was assessed with the Cochrane Collaboration’s tool for assessing risk of bias. Interventions were classified according to the BCTT. Results Eleven studies were included in the review. Risk of bias was moderate to high. Interventions were classified into the following categories: comparison of behaviour, feedback and monitoring, social support, natural consequences, identity and goals and planning. Four studies reported a positive adherence outcome following their intervention. Three of these interventions were categorised in the feedback and monitoring category. Four studies used behavioural approaches within their study. These were social learning theory, socioemotional selectivity theory, cognitive behavioural therapy and self-efficacy. Seven studies did not report a behavioural approach. Conclusions Interventions in the feedback and monitoring category showed positive outcomes, although there is insufficient evidence to recommend their use currently. There is need for better reporting, use and the development of theoretically derived interventions in the field of exercise adherence for older people. Robust measures of adherence, in order to adequately test these interventions would also be of use. This systematic review adds to the evidence for exercise adherence interventions specifically for older people. Uses a predefined behaviour change taxonomy allowing the categorisation and evaluation of interventions. Studies included were of moderate to high risk of bias. Exercise is an effective treatment option for a variety of conditions1 and in a number of chronic conditions its effectiveness may be comparable to drug interventions.2 This type of therapeutic exercise is defined as a subset of physical activity that is structured and planned, with the aim of maintaining or improving one or more aspects of physical fitness, in this way it differs from physical activity which is defined as any bodily movement generated by skeletal muscle.3 Prescribed exercise is a common treatment option used by health professionals such as physiotherapists.4 No definitive figure exists regarding the number of exercise programmes prescribed in a given year. However to give some indication as to the magnitude of this number, in 2014 there were 23 006 physiotherapists in the UK.5 A UK survey of organisations offering outpatient physiotherapy reported that of the 54% of organisations to respond 1 480 893 new patients were seen in a year.6 It is known from surveys of practice that exercise is a commonly used treatment modality across a range of conditions.7–11 It is therefore reasonable to assume that a significant number of exercise programmes are being prescribed yearly. Adherence to exercise is known to be variable. In their seminal paper, Sluijs et al 12 reported that 22% of patients were non-compliant, with 41% being partially compliant. Similar figures have been demonstrated subsequently.13 It is known that exercise adherence can affect treatment outcomes, with factors such as pain, physical function, physical performance and self-perceived effect of exercise being higher in those with better adherence.14 15 Therefore, low levels of adherence may limit the effectiveness of prescribed exercise. This makes adherence an important consideration for those who prescribe exercise. Adhering to exercise is important for all populations, however, there are several factors that make it crucial for older people. Exercise adherence in this population is affected by health status,21 and it is known that older people are more likely to have long-term conditions (LTCs) or multiple LTCs,26 for which prescribed exercise is a treatment option.1 Exercise engagement is known to be poor in older people following discharge from hospital,27 or discharge from physiotherapy.28 This is a critical consideration because treatment outcomes in this population are linked to compliance with interventions.29 There are a number of factors that have been identified as affecting exercise adherence in older people, including low self-efficacy, low motivation, depression, lack of interest, fear of falling, health status, physical ability, low expectations, socioeconomic status and exercise programme characteristics.21 27 28 Programme design was also a factor noted by Farrance et al 30 in a mixed-method systematic review of community-based exercise interventions for older people. They also reported six key themes related to adherence, these being social connectedness, participant perceived benefits, programme design, empowering/energising effects, instructor and individual behaviour. While it is important to understand the role of these personal factors and programme characteristics, it is also crucial to establish if there is anything clinicians can do to enhance adherence to prescribed exercise in older people. A Cochrane review exploring interventions to improve exercise adherence in those aged 18 years and over with chronic musculoskeletal pain34 reported that interventions such as self-management techniques and supervised as well as individualised exercise might improve adherence. More recently, Peek et al 35 reviewed adherence to self-management strategies prescribed by physiotherapists. They found that interventions using activity monitoring and feedback systems, written instructions and behavioural exercise programmes with booster sessions may be effective in promoting adherence. Although both these reviews were undertaken on adult populations, they did not breakdown the population further and, there remains a need to consider interventions specific to older populations. Disease-specific reviews that are relevant to older people have taken place, in particular considering arthritis. Ezzat et al 36 reported limited evidence for exercise adherence interventions in an arthritis population. Nicolson et al 37concluded that booster sessions, and behavioural graded exercise could improve adherence for those with osteoarthritis, in addition to motivational approaches for those with chronic low back pain. However, given that exercise is prescribed for a breadth of conditions,1 there is need to consider a broader, non-disease-specific review for older people to draw evidence from a wider population. Establish what interventions have been described in the literature to improve adherence to prescribed exercise in older people. Determine to what extent these interventions are effective at improving exercise adherence. Describe any underlying behavioural techniques or theory behind these interventions. The steps taken in the design and conduct of this review have been done so with consideration of the Preferred Reporting Items for Systematic reviews and Meta-analysis (PRISMA).43 44 This review has been registered with PROSPERO, registration number CRD42015020884 available at http://www.crd.york.ac.uk/PROSPERO. The following electronic databases were searched from inception up to May 2017 AMED, BNI, CINAHL, EMBASE, Medline and PsycINFO. Additionally, the reference lists of papers included in the systematic review were screened. Search terms were developed by JR. The terms were expanded at two consensus meetings attended by healthcare researchers. The list was reviewed by a healthcare librarian and further changes made. The terms make use of both subject headings and free text search terms. Figure 1 is an example of the search from Medline; Medical Subject Headings terms are shown in bold. An example of search terms from Medline. All databases were searched by JR, once studies were returned, titles and abstracts were screened and full texts were retrieved if the study was potentially relevant. A second reviewer EH also independently screened the title and abstracts of the studies retrieved by the Embase database. This comprised 1179 hits which was 20.55% of all the studies retrieved. JR and EH compared results, any disagreements were resolved by discussion. A third reviewer KB was available if agreement could not be reached. Once full texts had been retrieved, JR and EH independently assessed the studies against the inclusion criteria. After reviewing all full texts, results were compared. Where disagreement occurred this was resolved through discussion, KB was available if agreement could not be reached. Including a population that had a mean age of 65 years or older. Including a population that is community dwelling. Studies including intervention(s) aiming to improve adherence, compliance, concordance to or engagement with exercise, compared with either no adherence, compliance, concordance or engagement intervention; another adherence, compliance, concordance or engagement intervention or an intervention which does not aim to improve adherence, compliance, concordance or engagement. A comparator group which was also undertaking the exercise programme. Where a no intervention control group occurred, there needed to be a least two active intervention groups to offer a comparison. Studies including a population with a diagnosis of dementia or cognitive impairment. Any study design that was not an RCT. Protocols, feasibility and pilot studies including pilot RCTs. Two reviewers independently extracted information from the included studies using separate, standardised preprepared forms. Data were extracted about study design, participants, setting, type and dose of intervention, underlying theory behind the intervention, the comparator arm, the method of assessment, outcome measures used and study findings. Two reviewers assessed study quality independently. One reviewer was blinded to author, journal, publication date and affiliations. The Cochrane Collaboration’s tool for assessing risk of bias was used.45 Each study was reviewed for the following items: sequence generation, allocation concealment, blinding of participants and personnel, blinding of outcome assessors, incomplete data, selective outcome reporting and other sources of bias. Each item was graded as low risk of bias, high risk of bias or uncertain risk. For sequence generation, if an appropriate method of randomly generating group allocation, to allow for comparable groups was described, this was scored as low risk of bias. If a non-random method was described and/or groups were significantly different in baseline characteristics, it was scored as high risk. If the description was not clear, it was marked as uncertain risk. For allocation concealment, where a method of concealing assignment, that is, the participant or investigator could not predict assignment, such as opaque sealed envelopes this was scored as low risk. If a method enabling participants or investigators to be able to predict assignment was used, this was graded as high risk. Where information was not clear, this was scored as uncertain risk. For blinding of participants and personnel, if where possible studies reported blinding of participants and personnel this was scored as low risk. If it was possible to blind participants and personnel but this was not done, this was graded as high risk. It is acknowledged that blinding of participants and personnel is very difficult in exercise and rehabilitation studies, therefore if the reviewers felt that blinding was not possible it was scored as uncertain risk. For blinding of outcome assessors, studies where there was specific mention of steps to blind either outcome assessors, or those handling the data if outcomes were self-report questionnaires or surveys filled out at home, this was scored as low risk. If outcome assessors were not blinded this was rated as high risk. Where unclear this was graded as uncertain risk. For incomplete data, if there was little or no incomplete data, and if appropriate measures were taken to deal with missing data, this was scored as low risk. If there was a large amount of missing data, or no appropriate steps to manage missing data this was marked as high risk. Where it was unclear, this was scored as uncertain risk. For selective outcome reporting, if a study protocol was available and all outcomes described were reported this was scored as low risk. If not all outcomes were described this was scored as high risk. Where no study protocol was available this was rated as uncertain risk. For the final domain, other sources of bias, studies were scored as low risk if the reviewers felt there were no other sources of bias that could affect the results. As high risk if there were other potential sources of bias, such as small sample size, where unclear this was scored as uncertain risk. Disagreement between reviewers was resolved through discussion. If consensus was not met a third reviewer was available. If it was necessary authors were contacted for further information. The heterogeneous nature of the interventions and the different outcomes used for measuring exercise adherence prevented the use of meta-analysis. 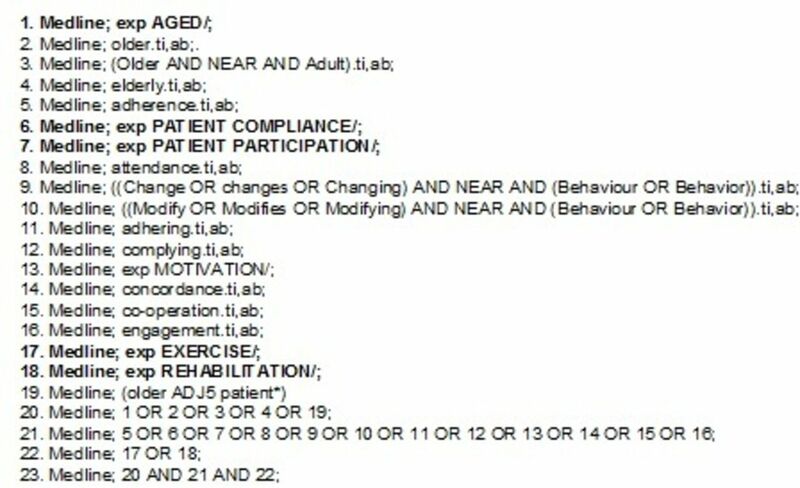 Therefore, the interventions are classified according to the behaviour change techniques that they employ, as described in the predefined BCTT.33 This taxonomy categorises behaviour change techniques by the active ingredients they use. Interventions from included studies were grouped into categories according to the techniques that they employed. Study interventions were reviewed and compared against the definitions used to define each technique. All techniques in the taxonomy fall within 1 of 16 categories. The interventions were placed into categories according to the techniques that were identified during the process of reviewing and comparing against technique definitions. A total of 5737 papers were identified through database searches, after screening the title and abstract and removing duplicates 5425 were removed. The full text was retrieved for the remaining 312 papers, 301 papers were removed at this stage as they did not meet the inclusion criteria. This left 11 studies which were included in the review.40–42 46–53 A flow chart of this process can be seen in figure 2. Eleven studies were assessed using the Cochrane Collaboration’s tool for assessing risk of bias. No studies were rated as low risk of bias, two as moderate risk of bias and nine as high risk of bias. The scores for each domain can be seen in figure 3. The most common area where risk of bias was observed was in the relatively small sample sizes, and the lack of sample size justification of most studies. Several types of intervention were identified, these are categorised according to the BCTT developed by Michie et al.33 For a full description of the studies see table 1. One study with high risk of bias41 compared exercise instruction given in audio and video format in addition to written instructions, they found no significant difference in mean exercise adherence between groups at 1–4 weeks (P=0.690) and 5–8 weeks (P=0.538). One study47 with a high risk of bias, provided heart failure participants with individual graphic feedback, related to their exercise goal. They found a significant difference between number of exercise sessions completed between a group that received the intervention and a control group at 24 weeks (P<0.01). Another study40 with a high risk of bias, compared adherence with a Tai Chi exercise programme delivered through an interactive telecommunication approach, or a class in a community centre, compared with exercising at home with a digital versatile disc (DVD) for people at risk of falling. They found the telecommunication and community-based groups had significantly higher results for time exercising and attendance rate compared with home exercise (P<0.01). A further study52 with a high risk of bias, compared a weekly exercise and motivation classes lasting 6 months against written and verbal exercise advice, for those with intermittent claudication. Participants were advised to walk at least three times a week to near maximal pain. At 6 months, there were more participants in the intervention group who reported to be walking either three times a week, or more than three times a week, in comparison to the advice group (P<0.012). A study46 with a high risk of bias, tested an adherence intervention for participants with chronic lung disease. The intervention included weekly phone calls and one home visit over a 3-month period. The phone calls and visit included dealing with queries about exercise adherence and exercise maintenance, problem solving, discussion and recommendations about health problems and encouragement. With home visits that evaluated home safety and helped establish an individualised exercise routine. This study found a short-term difference in minutes of exercise undertaken, between the intervention and a control at 20 weeks (P<0.05). Although this difference was absent at 1 year follow-up. A second study with a high risk of bias48 looked at guidance and supervision for the frail elderly, testing the difference between a high guidance group and a medium guidance group. They found no difference between groups for percentage of exercise sessions undertaken. A third study with a high risk of bias53 compared a group that received psychoeducation, peer support and group exercise, with a group that undertook self-guided psychoeducation and exercise. They found that both groups attended a similar number of exercise sessions at 12 weeks. A study50 with a moderate risk of bias, investigated supervised exercise versus home-based exercise with no supervision. They found no significant difference between groups with regard to total exercise sessions completed (P=0.712). One study49 with moderate risk of bias provided two different types of adherence messages based on Socioemotional Selectivity Theory,54 one message emphasised emotionally meaning reasons to exercise, for example, spending time with loved ones. The other message emphasised knowledge-related goals, for example, stronger muscles. No significant difference was found in an average adherence score between the two groups 2 weeks after discharge from physical therapy (P=0.03). One study42 with a high risk of bias, compared cognitive behavioural therapy (CBT), an attention control education group and a control group. The primary emphasis of the CBT was to teach older people to recognise and modify their thoughts or interpretations about exercise. They found no significant difference in time spent exercising between groups at 3, 6, 9 and 12 months. A study51 with a high risk of bias, compared a structured educational counselling booster session, given over the phone, or face to face, compared with usual care. During the booster sessions, participant’s individualised goals were used as a basis for intervening. Where participants were progressing towards goal achievement they received praise, and were encouraged to attribute their accomplishment to their own ability. In addition, discussion of factors inhibiting achievement of goals took place. They found no significant differences in adherence rates between groups at 3 and 6 months. Prescribed exercise is a prominent treatment option, which is likely to be used further as people live longer,62 with more likelihood of LTCs.26 Strategies to promote adherence should therefore remain an important factor for those who prescribe exercise. An area in which exercise adherence research could move forwards would be to consider the theory that underpins interventions. Measuring adherence is essentially measuring behaviour change in participants, that is, the participant’s behaviour corresponding to recommendation from a healthcare provider,16 in this case following an exercise programme. It is interesting that seven of the studies included did not appear to have used any behavioural theory. This could have potential impact on the effectiveness of interventions. An important aspect in developing complex interventions, as outlined by the MRC’s guidance is using the best available evidence and appropriate theory.63 If adherence interventions lack theoretical underpinning, then the chances of successfully changing people’s behaviour may be limited. It may also affect the ability to appropriately categorise and replicate interventions. Even where behavioural approaches are considered, there may still be room for further consideration. Michie et al 64 developed a framework for behaviour change interventions, The Behaviour Change Wheel. This model posits that the three crucial components to behaviour change are capability, opportunity and motivation. Interventions may need to target one, two or even all three components to facilitate change. Approaches targeting only one area may not result in the desired change in behaviour. For example, giving information may target capability, while having no effect on opportunity or motivation. Well-developed interventions underpinned by appropriate theory, are likely to maximise the potential for behaviour change, in this case adherence to prescribed exercise. 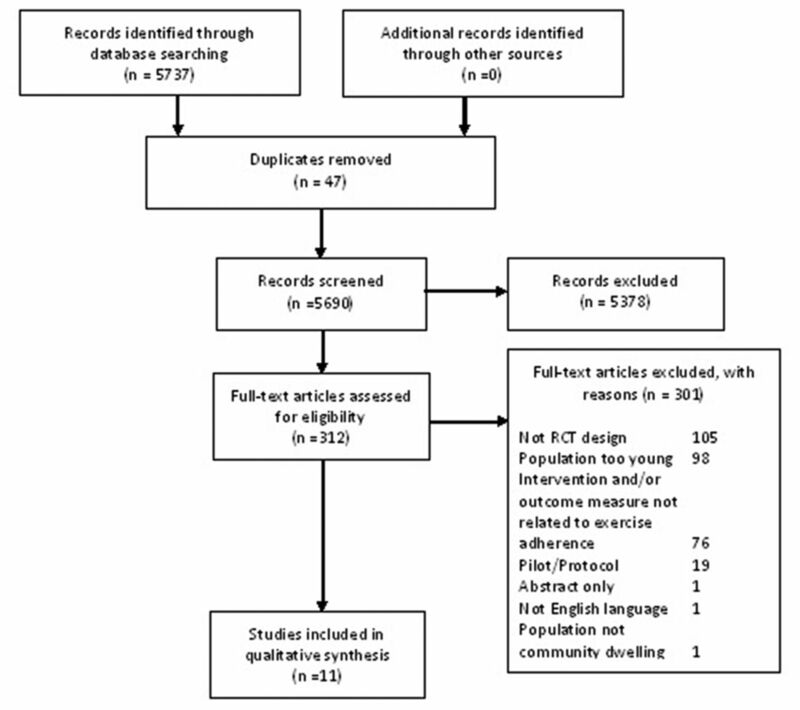 This review systematically searched the literature with clear inclusion and exclusion criteria using an appropriate risk of bias assessment tool. It also used a predefined BCTT allowing the categorisation and evaluation of interventions. Limitations of this review include the moderate to high risk of bias of the studies, in particular due to small sample sizes leading to underpowered studies. Also, it was not possible to perform meta-analyses due to the heterogeneous nature of the interventions and measurements of adherence, it is also known that there is a lack of well-developed measures of adherence for therapeutic exercise,65 making it more challenging to capture the effect of adherence interventions. Another consideration is that although it was beyond the scope of this review to analyse health outcomes, adherence promoting interventions do need to be considered in the context of these health outcome results. For it is appropriate to ensure that intervening to promote adherence also offers an improvement in health outcome, or at least causes no harm. Finally, only papers published in English were considered for this review. It is possible that there are studies published in languages other than English that would have changed the results of the review. Interventions that focused on feedback and monitoring demonstrated significant results. However, these types of intervention need to be tested in appropriately powered trials. Second, there is need for the development of adherence interventions underpinned by appropriate theory. Finally, there is need for robust adherence measures that are valid and reliable to be developed, in order to adequately assess the effectiveness of interventions. This review provides an overview of interventions to improve exercise adherence in older people. Interventions grouped in the feedback and monitoring category of the BCTT demonstrated positive effects on exercise adherence, although risk of bias limits the generalisability of these approaches. There is need for better reporting, use and the development of theoretically derived interventions in the field of exercise adherence for older people. Robust measures of adherence, in order to adequately test these interventions would also be of use. The authors acknowledge Mary Boulton who provided supervision to JR through the study. Chartered Society of Physiotherapy. What is physiotherapy? 2013. http://www.csp.org.uk/your-health/what-physiotherapy (accessed 18 Jun 2015). Chartered Society of Physiotherapy. Physiotherapy outpatient services survey 2012. London 2013. World Health Organisation. Adherence to long-term therapies. Geneva 2003.
. Interventions for enhancing medication adherence (Review). Cochrane Database Syst Rev 2014;11:CD000011. NICE. Behaviour change: individual approaches. London 2014.
. The behaviour change wheel: a guide to designing interventions. Silverback Publishing 2014.
. Preferred reporting items for systematic reviews and meta-analyses: the PRISMA statement (Reprinted from Annals of Internal Medicine). Phys Ther 2009;89:873–80.
. Assessing risk of bias in included studies. In: Higgins JP , Green S , eds. Cochrane Handbook for Systematic Reviews of Interventions. Chichester: Wiley-Blackwell, 2008:187–241.
. Social learning theory. Soc Learn Theory 1971;1:46. NHS Choices. Cognitive Behavioural Therapy (CBT). 2016 http://www.nhs.uk/Conditions/Cognitive-behavioural-therapy/Pages/Introduction.aspx (accessed 15 Jan 2017).
. Developing and evaluating complex interventions: New Guidance. London, 2008. http://eprints.ucl.ac.uk/103060/ (accessed 30 Jul 2014). Contributors JR conceived the study and was responsible for study design and search strategy, JR and EH were responsible for data extraction, quality assessment and data analysis. KB and HD provided methodological advice. JR drafted the manuscript, this was revised with input from EH, KB and HD. All authors approved the final version. Funding This work was supported by the Centre for Movement and Occupational Rehabilitation Science (MOReS) Oxford Brookes University, and the Physiotherapy Research Unit, Nuffield Orthopaedic Centre, Oxford . Data sharing statement There are no additional data available for this review.